UK Speedtrap Guide. Radar, GPS and Laser radar detector guide. Ultra Cool & Must Have! side are a normal number plate. The reflection in the top left is the Gatso Camera used for the test. With the co-operation of Staffordshire police we tested the Argtec Digitec number plate. The plate costs $39 and is ordered over the internet via PayPal. The plate I was sent was a sample saying GATSO, it's designed to reflect back the light from the camera flash and cause an over exposure on the film in the area of the number plate. We tested it with my digital camera, the result was good. 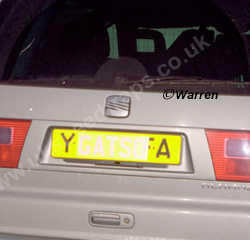 The plate was unreadable with the digital camera so it was down to the Gatso to prove it could do the job of seeing the number plate. The sample plate was mounted over my existing number plate with double sided tape, we then drove the vehicle past the gatso triggering the camera. The resulting negatives were then played with to see if changing the contrast or brightness, or any other way of changing the image for that, could reveal the digits on the plate. Viewing as a negative and flicking the contrast and brightness around we could reveal the number plate in all its glory. The police have instant settings for changing the views and they also revealed the digits. It took them seconds to read the plate. and brightness change,s show the plate digits. after you and throw the book at you for trying this on. camera with a manual flash set on max, not fill in. One other comment, the sergeant said he could spot the plate a mile off because the numbers were reflecting too well in his headlights. He would pull me for that and most likely give me a ticket for a non-approved plate or may even try to get me on perverting the course of justice. Can we recommend it, No. I would not trust the Digitec to save me from a ticket. 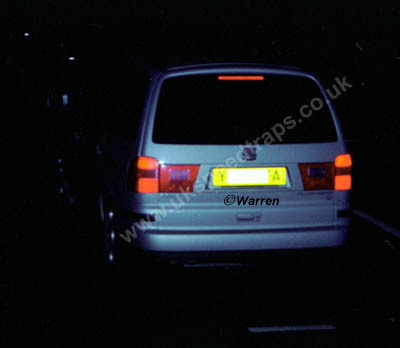 the copyright material of the The UK SpeedTrap Guide and Steven J Warren. 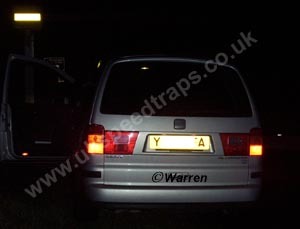 The UK SpeedTrap Guide and Steven J Warren. All rights reserved. The information contained in this website is provided purely for information purposes.